Ranginui, the sky father, was torn away from Papatūānuku, the earth mother, and formed the vault of the heavens. When Māori looked up at the sky they saw the sun god, Te Rā, whose journey was slowed by the legendary Māui. At night, they sometimes saw Rona, who had been pulled up from Earth by the Moon. These live among a vast family of celestial bodies, all encompassed within Ranginui. Māori call the heavens Ranginui, the sky father. When the world was created, Ranginui was pressed against Papatūānuku, the earth mother. Their children did not like living in the cramped, dark space between them, so one of their sons, Tāne, the god of forests, lay on his back and pushed up against the sky with his feet. The sky was ripped away from the earth, and Tāne planted poles to hold them apart. The heavens had 10 or 12 layers. Tāne climbed to the highest level to get three baskets of knowledge, which he then passed on to humankind. 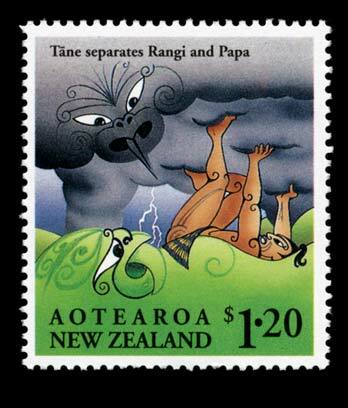 Other Polynesian cultures have myths similar to the story of Ranginui and Papatūānuku. In Rarotonga, for example, the world was created when the goddess Varima-te-takere plucked Ātea, the sky father, from her side. Growing bigger, he changed his shape to form the heavens, and married Paparoa-i-te-itinga, the earth mother. In Māori tradition the family of light are the sun, moon, planets, stars and constellations. Tamanui-te-rā, the sun, was the main god of the heavens. He used to race across the sky, not giving people any time to work or rest, until the demigod Māui lassoed him with ropes and forced him to travel more slowly. The moon was associated with women and fertility. There are many stories to explain the appearance and movement of the planets and stars. Meteors were thought to be a sign of a future event such as the death of a chief.